You'll be £10.00 closer to your next £10.00 credit when you purchase Voices from the Peninsula. What's this? The Peninsular War was one of the most successful campaigns ever fought by the British Army. Between 1808, when British troops landed in Portugal, and 1814, when Wellington's Army advanced into the south of France, British soldiers were involved in countless battles and sieges against Napoleon's vaunted French veterans. Drawing on rare letters, diaries and memoirs, Ian Fletcher presents a superb insight into the daily lives of British soldiers in this momentous period and evokes such key battles and sieges as Vimiero, Talavera, Badajoz, Salamanca, Vittoria and San Sebastian. The author’s skilful compilation of accounts, placed in context by important background detail, make this the story of the Peninsular War in the words of the men who marched, fought and triumphed with Wellington. 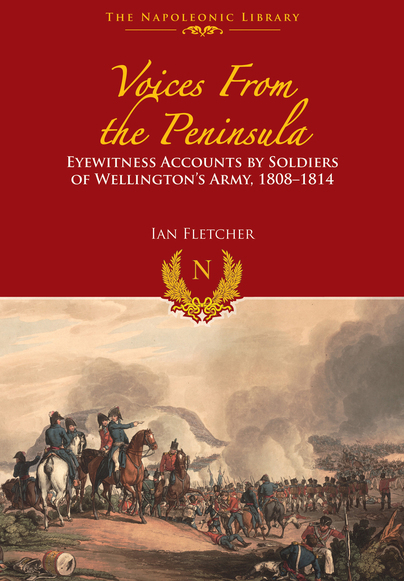 Although there have been many accounts of soldiering in Wellington's army, Voices from the Peninsula throws new light on the experience of Napoleonic warfare and brings to life what Wellington called 'the finest military machine in existence'. By using letters and diaries Fletcher succeeds in describing the regeneration of the British army under Wellesley. Sure to satisfy enthusiasts of Napoleonic Wars again and again. For those who specialize in the Peninsular War, there really is not much new in the book. However, its narrative is so compelling that it would be a perfect gift to give someone who wants to know why you are interested in the Napoleonic Wars. The individual stories told in Voices from the Peninsula will draw them in and likely spark a new generation of Napoleonic historians! Recommended. The Peninsular War was arguably one of the most successful campaigns ever undertaken by the British army. Between 1808 when British troops landed in Portugal and 1814 when Wellington’s army marched into the south of France, British soldiers were involved in numerous actions against Napoleon’s troops. Following an introduction and a brief summary of the Peninsular War, Ian Fletcher draws on rare letters, diaries and memoirs to present a fascinating insight into the daily lives of some of the British soldiers involved in the campaign, which involved important battles such as Vimiero, Talavera, Badajoz, Salamanca and Vittoria. First published in 2001 and now again in 2016 in hardback edition, the book includes nearly 30 monochrome illustrations, six maps and is rounded off by a bibliography. Well worth adding to the Napoleonic bookshelf!